Today we went all around Ft. Hood. Jim wanted to go see the place where his parents lived when he was born. His dad was able to give us great directions to the post housing. Gates to get on Ft. Hood don't change very much. We easily found the neighborhood, but we finally figured out that the houses must have been renumbered. 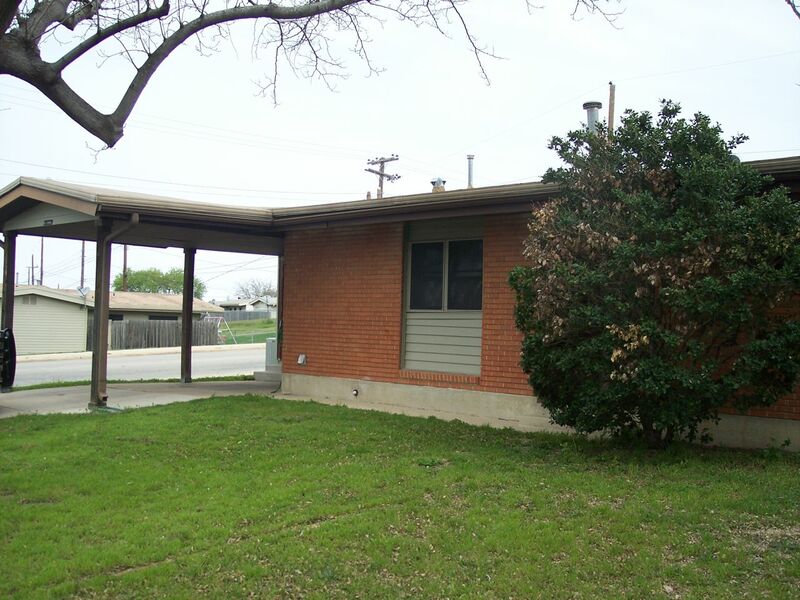 So after a quick call to his dad, Jim found the exact house they lived in. It was on a corner, so that really helped. We took lots of pictures, and we are excited to show his parents. 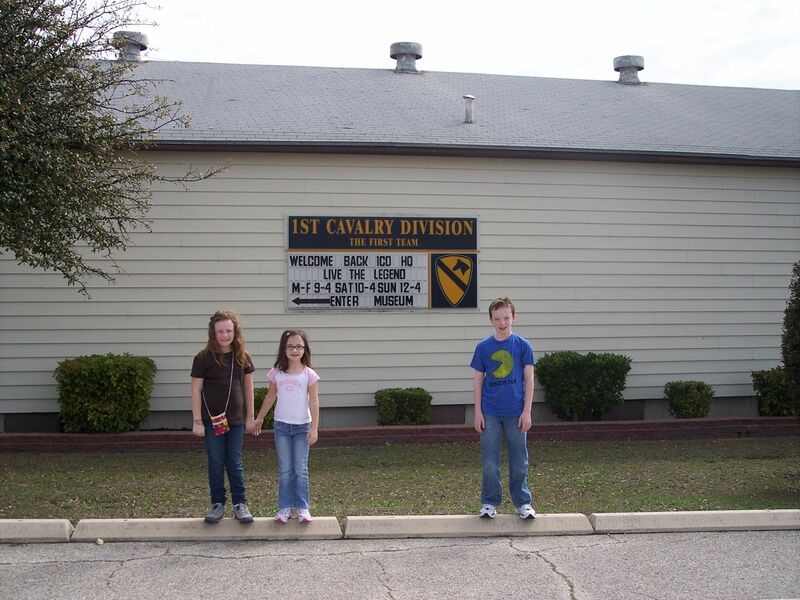 Then we went to the 1st Cavalry Division museum. This museum chronicles the Cavalry throughout American history, and the role it has played in all of the major conflicts around the world. It was interesting to see how important the Cavalry is, and how it has changed and developed through the years. In back of the museum was a field full of vehicles used by the Cavalry. 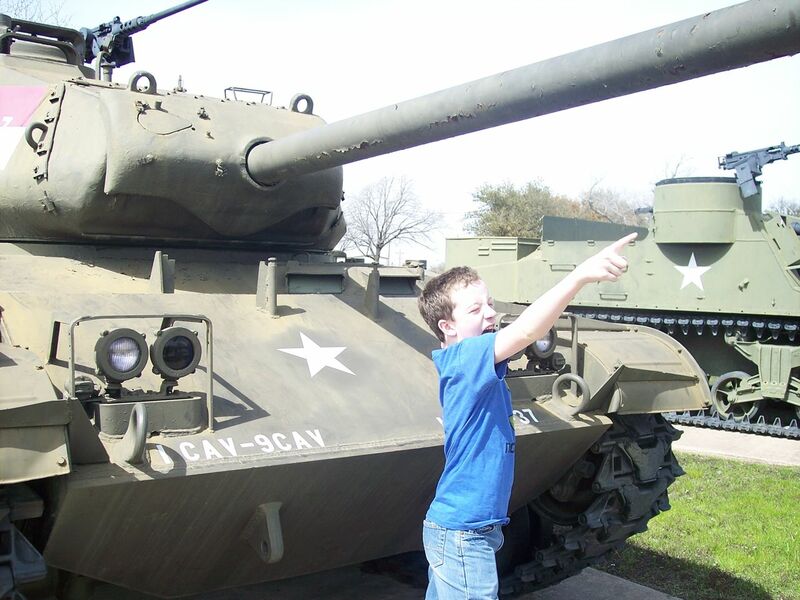 There was everything from tanks to jeeps to armored personnel carriers. Very cool. After that, we went to the Exchange to do some shopping (of course!). Gotta love that tax-free shopping. Craig took us over to the unit he helps support. 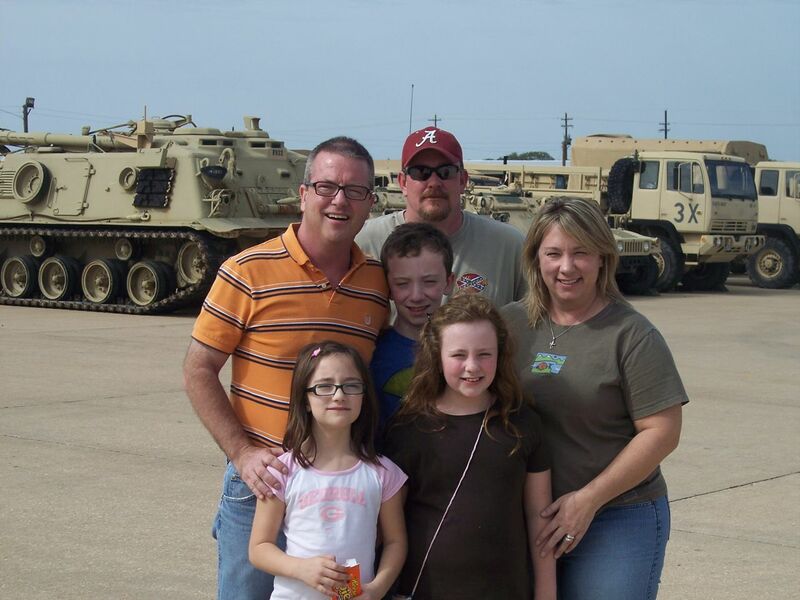 He is a civilian contractor that backs up an Army unit in the repair of their Bradley vehicles. He has gone to Iraq four times with an Army unit. He served in the Army for several years, and has a lot of respect for the Soldiers he works with. 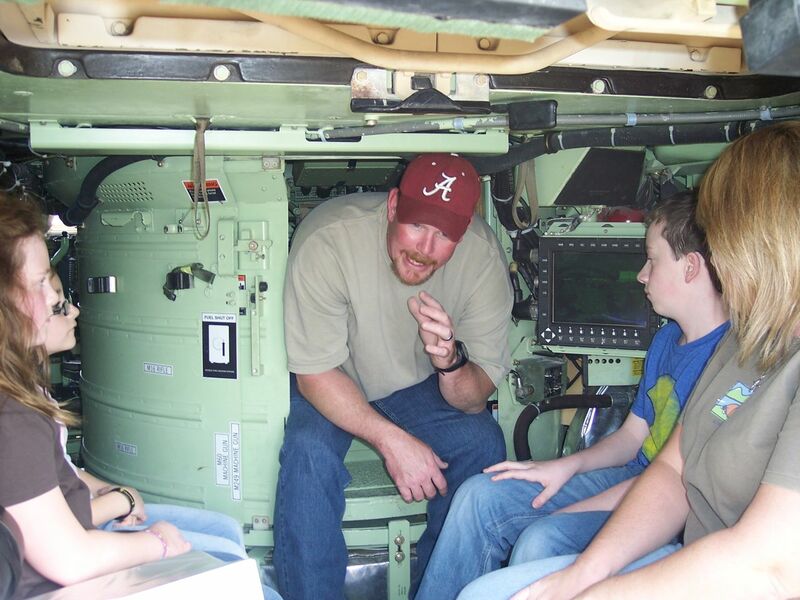 He was able to get us in a Bradley, and let the kids, as well as me and Jim, get up in the gunners' seats and explained how everything works. It was really neat. The equipment Soldiers have at their disposal is amazing. I must say Jim and I were thoroughly impressed by Craig's knowledge. He definitely knows his stuff, and he really enjoys his job. He explained why night vision goggles, as well as some of the sights the gunners use, are in green. It all has to do with the eyes and how they see and respond to colors. 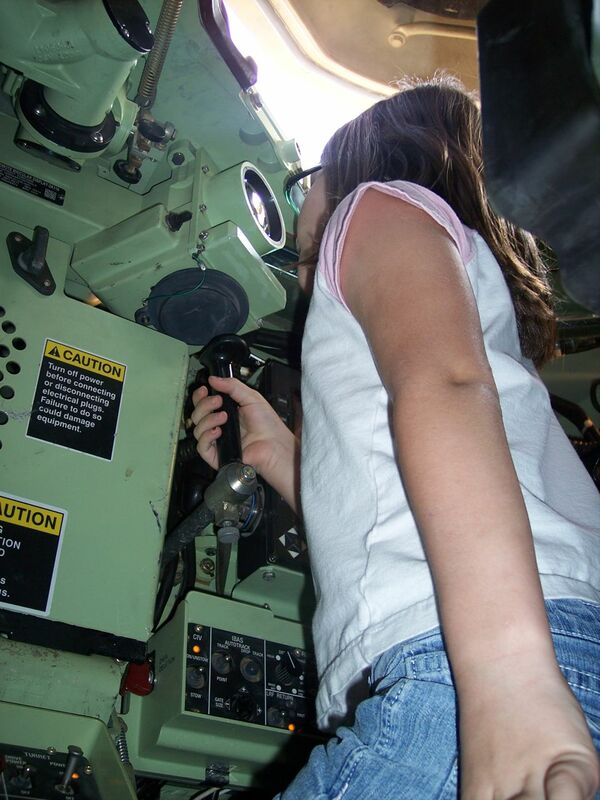 He also explained how all of the computer screens inside of the Bradley worked, what they were for, and who used them. It was quite a lesson in modern warfare! The Soldiers that work with Craig were there and very nice, too. After our Bradley lesson, we headed back to Craig's house for the evening. The kids, theirs and ours, all played outside for a long time.. 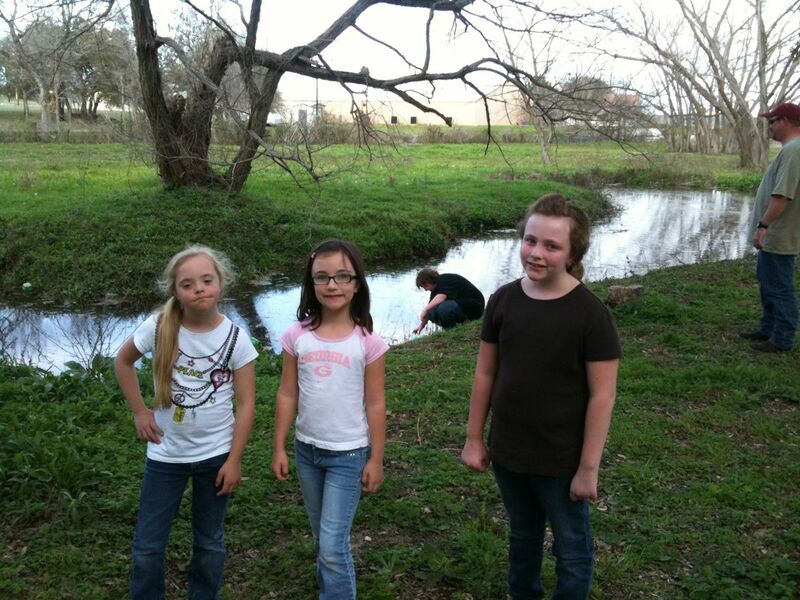 The weather was so pretty, and they have a small creek and lots of trees….it was the perfect way to end our day. Oh, and Randa cooked for us! She is a fantastic cook and it was wonderful to have a home cooked meal. Tomorrow we are headed towards Austin, but we have schoolwork and a little bit of preventative maintenance to do, so we may not make it to Austin just yet. Today was primarily a driving/homework day. We left Houston and headed for Kempner, Texas. Kempner is just west of Ft. Hood in central Texas. 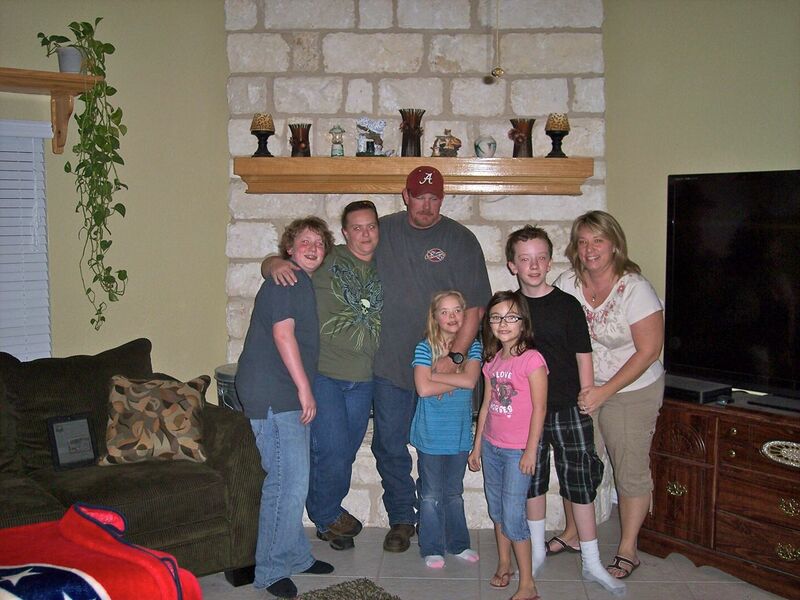 My cousin Craig lives there with his wife, Randa, and their two children, Jacob and Kiersten. Another reason to visit this area is because Jim was born at the hospital on Ft. Hood. His father was stationed there during that time, and they lived in the post housing. We did see a few interesting sites along the way. 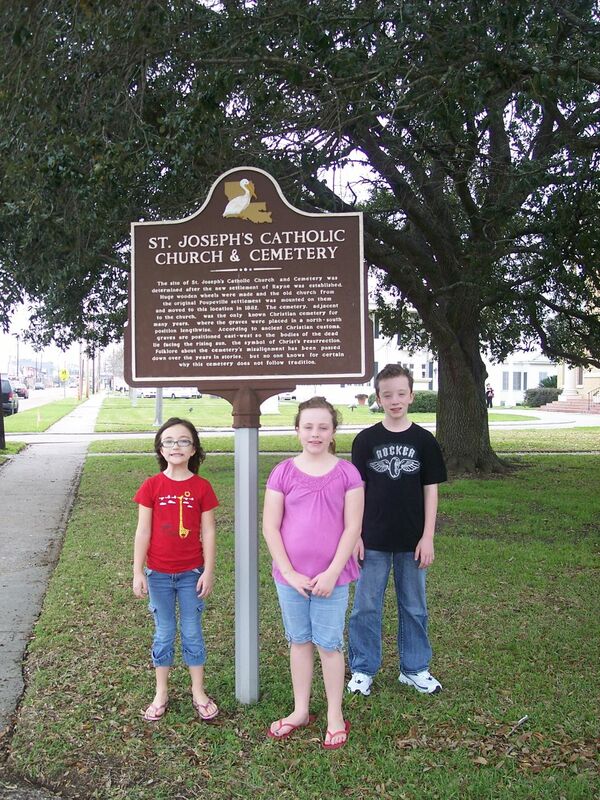 We saw a historic marker sign and followed it for a few miles until we came to the marker. It was a cemetery for Union Army POWs. It was near a Confederate camp during the Civil War. The majority of these prisoners died of malaria. It was a somber little place on the side of the road. There were some beautiful horses on the way, so we had to stop and get a few pictures. 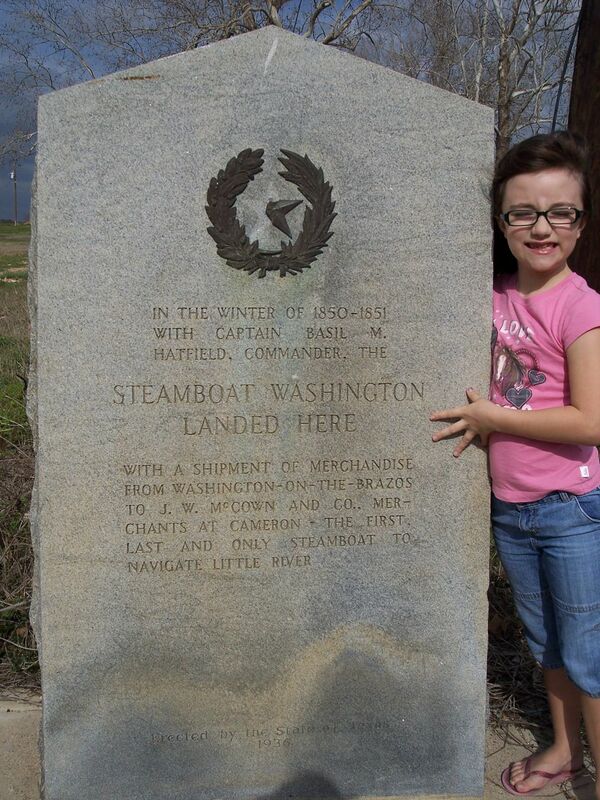 We passed another marker that told of how the Steamboat Washington landed in this spot during the winter of 1850 - 1851. The steamboat was the first, last, and only steamboat to navigate the Little River. We eventually got to Craig and Randa's house. 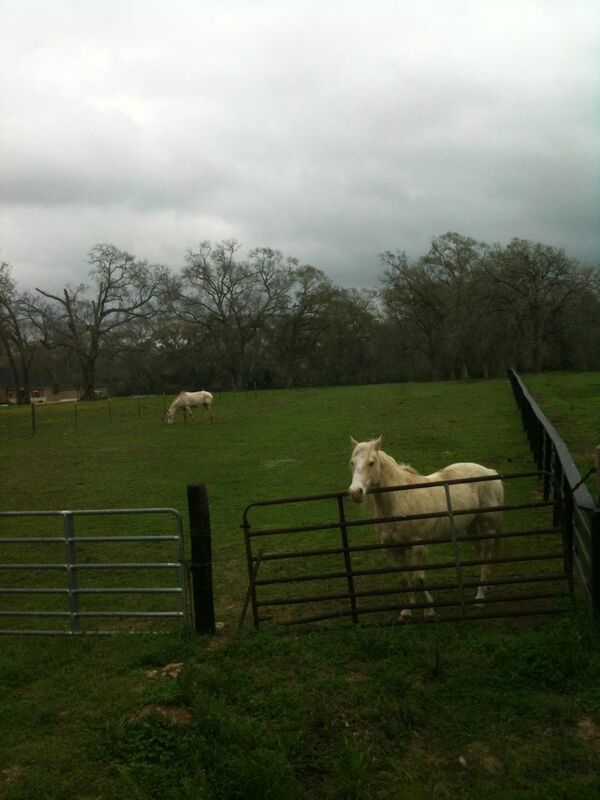 They recently bought a home on five acres, and even though it isn't too far from 'town', it is absolutely beautiful. It is peaceful and serene. 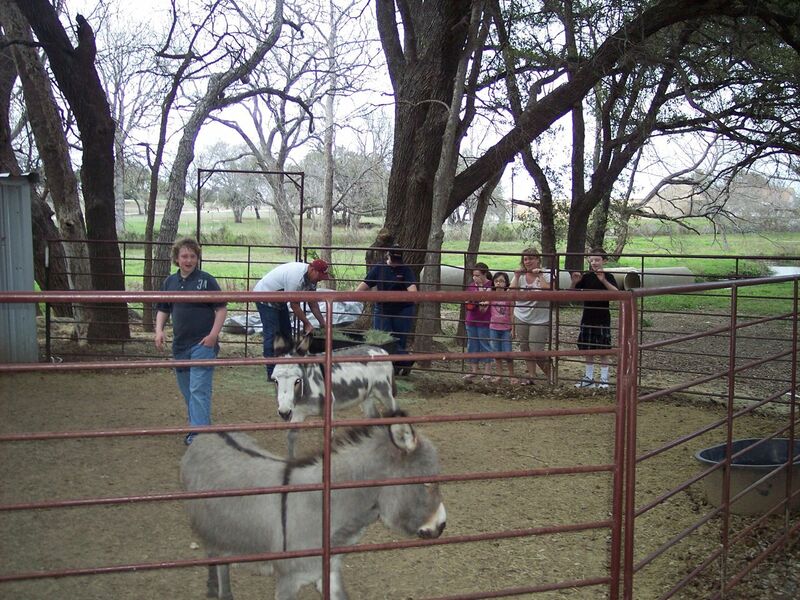 They inherited two donkeys from the previous owners. They previous owners were not able to find a new home for the donkeys, so Craig and Randa said they could just stay there. Their names are Beethoven and Fiona. Fiona likes to eat shirts. After we visited for a little while, we went to a great Italian restaurant named Giovanni's Italian Restaurant in Copperas Cove, Texas. If you are ever in the Ft. Hood area - you never know! - I highly recommend Giovanni's. They had huge portions and it was delicious! Tomorrow Craig is taking the day off of work and taking us all around Ft. Hood. We are really looking forward to it! This morning we worked on schoolwork...yawn. Not much excitement for any of us, but necessary. 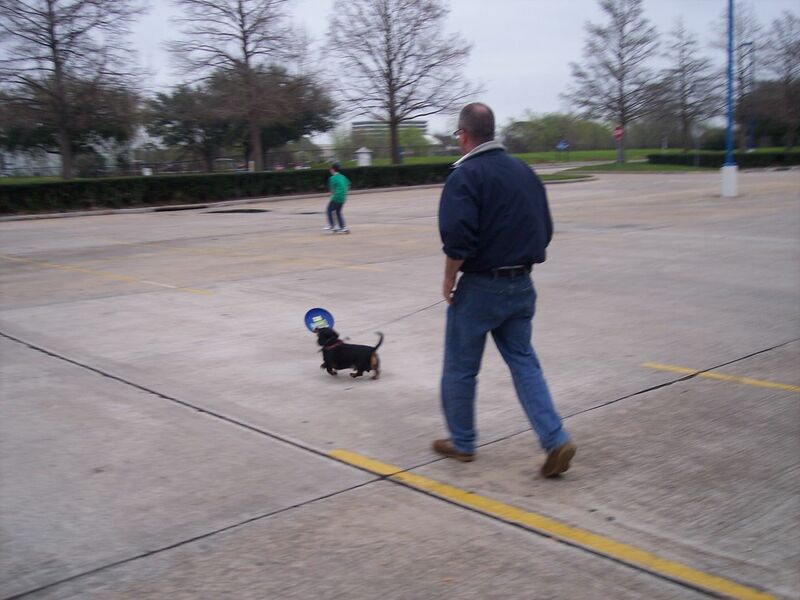 But that's okay, for when we were done, we headed back to Space Center Houston! We just didn't have enough time yesterday, so we were excited to go back. This is where he was upside down. 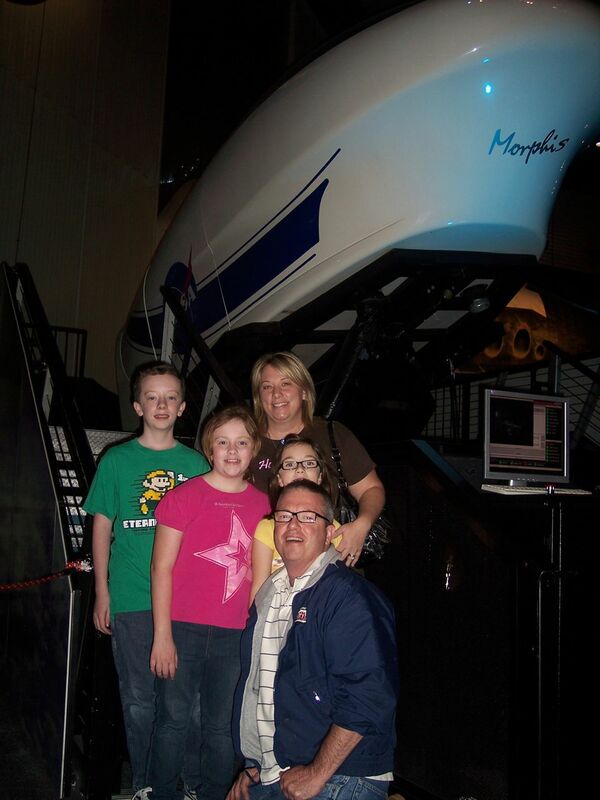 The first thing we did was let Michael ride a flight simulator game. There was a stand-alone game system that allowed you to practice and get tips from the instructor prior to playing the game for real. In the real game, you get inside this little space ship looking thing, and you battle and shoot the bad guys. You control the 'ship' while you are inside, and part of the fun is making it turn upside down. Michael isn't a roller coaster fan, so I wondered how this would turn out. He actually had a really good time! There was a screen where we could follow what he was doing inside the game, so we took pictures from that. Next we went to an exhibit of what it is like to live in space. The explained what each compartment in the crew quarters was for, how they showered, ate, and took care of, um, personal business. The original space station (the Sky Lab from the 70s) was equipped with a shower, but due to the weightlessness in space, it was very difficult to shower. The water floating around also posed a hazard to the equipment on board, so they eventually went to a sponge bath type of system, using moist wipes similar to those used in hospitals. It was interesting, I hate to say, to learn how they use the restroom in space. Reminds me a little of the RV....but I digress. After that enlightening talk, we headed into the Blast Off Theater, where we could experience the effects of blasting off into space. That was followed by an update of the current mission to Mars, lead by the Rover Curiosity. The rover launched in November, which we had hoped to see while we were in Miami. It is an eight month trip to Mars! Not a quick trip! After the Blast Off Theater, we all went over to another simulation game, and this one accommodated fifteen people. It was a lot of fun, too. Then Rachael wanted her turn on the flying game. She turned herself upside-down at least six or seven times - compared to two times for Michael. We figured out that she didn't realize she was the one making herself flip like that. Her face had this half-scared, half-brave expression on it. You could tell when she finally realized she was doing it to herself. The last place we visited was the Starship Gallery. This place houses the main exhibits of the Space Center. It holds the largest collection of moon rocks in the world, as well as several actual space capsules and training modules. The actual training module of the Sky Lab was there, and you could walk through it. 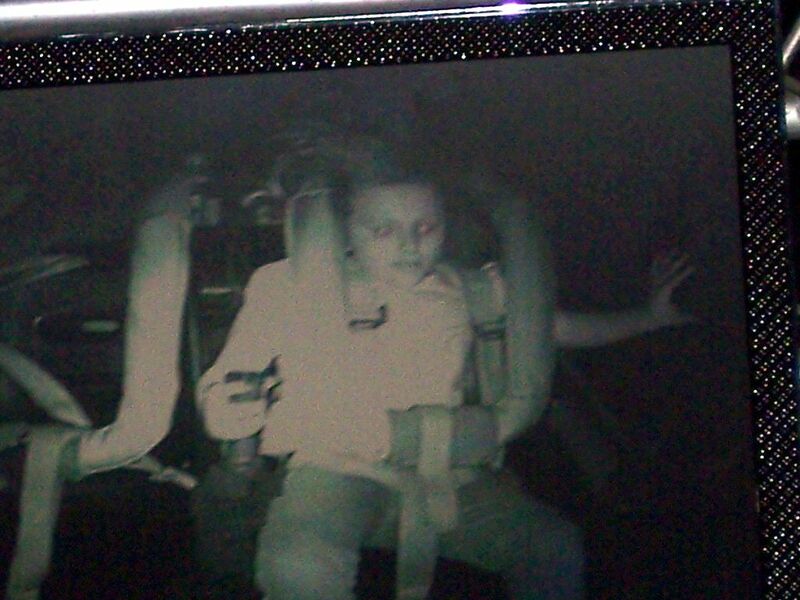 There were life-like astronauts in there, and placed in unexpected places, so they scared us at first. We weren't expecting to see someone looking back at us! Michael is studying the sky in Science right now. With each chapter, his Science teacher requires a small project of some sort to be done related the topic. It can be anything from a poster to a demonstration. What better to do for this chapter than something from the Space Center? Michael decided to make a video about the Sky Lab. Once he is done editing it, he will post it on You Tube and give his teacher the link. Not too bad to be so far away! Once it is posted, I will put a link to it here on the blog. 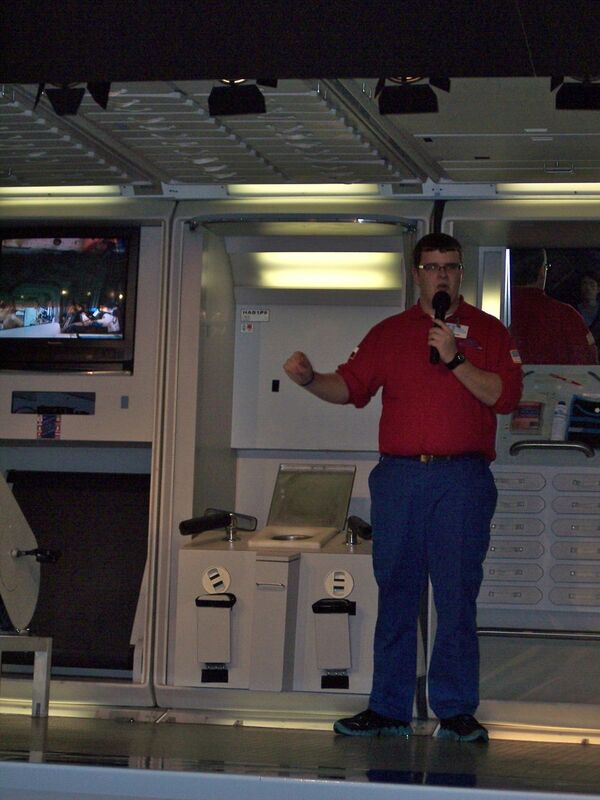 Once we finished in the Starship Gallery, it was time for the Space Center to close. We went outside to the RV, let the kids ride their scooters in the parking lot, and let Sam play with his frisbee for a little while. That was pretty funny, because Jim had him on his leash and had to run to keep up with him. There was a lady waiting for the bus nearby, and she was laughing at their antics. We really enjoyed it. 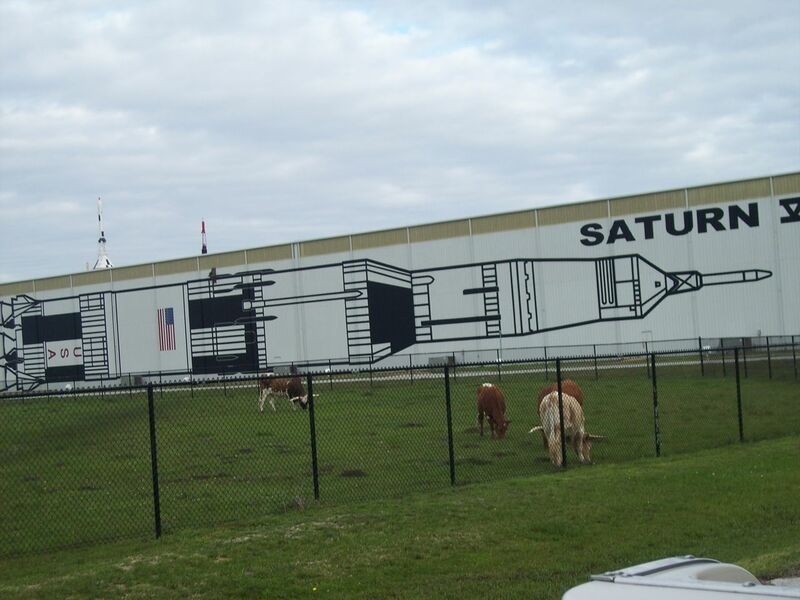 The Space Center, along with the children's museum, makes Houston, Texas, a great place to visit. There is a lot more to do in the city, so I do recommend planning a few days here if you ever get the chance to visit. 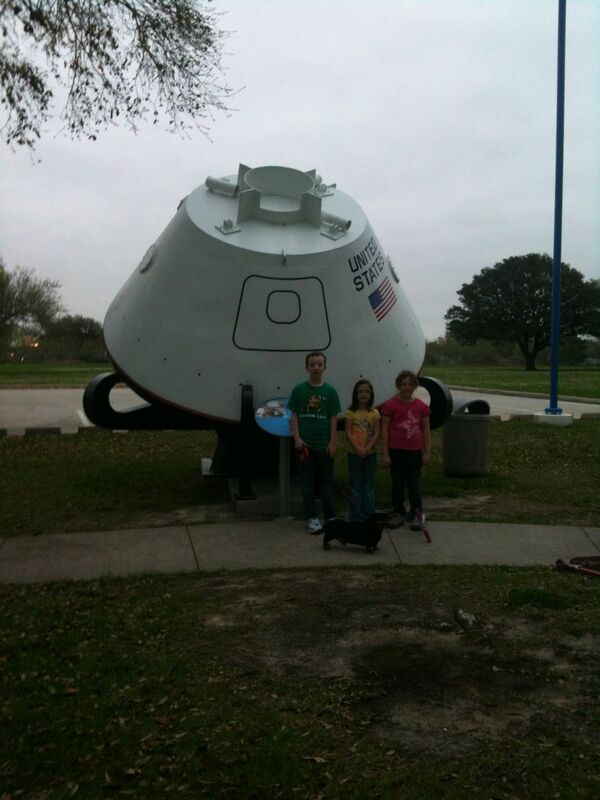 Today we went to Space Center Houston, home of the primary NASA facilities for training and planning. 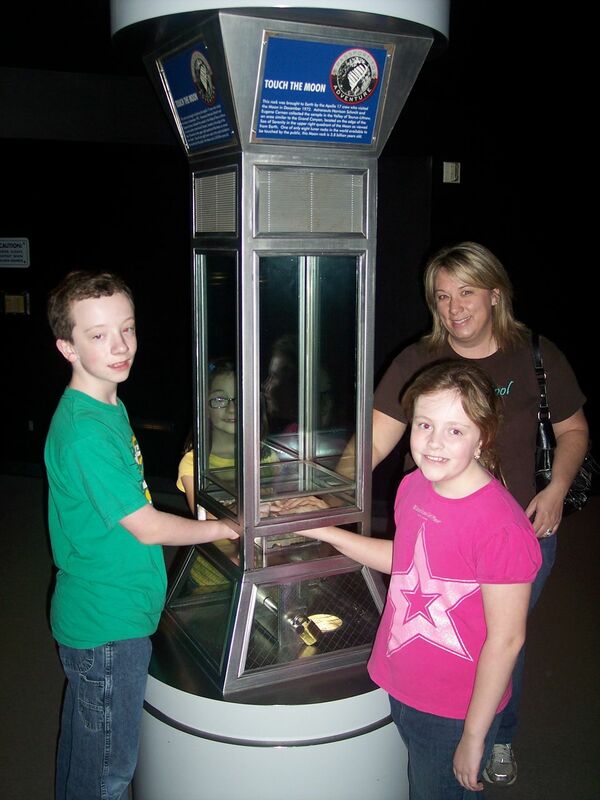 It was similar to the Space Center in Huntsville that we went to last September, but different in that it was much more comprehensive in its exhibits and experiences. The first thing we did was their Tram Tour. This tour loads you onto their trams and takes you all around the NASA buildings on the grounds. 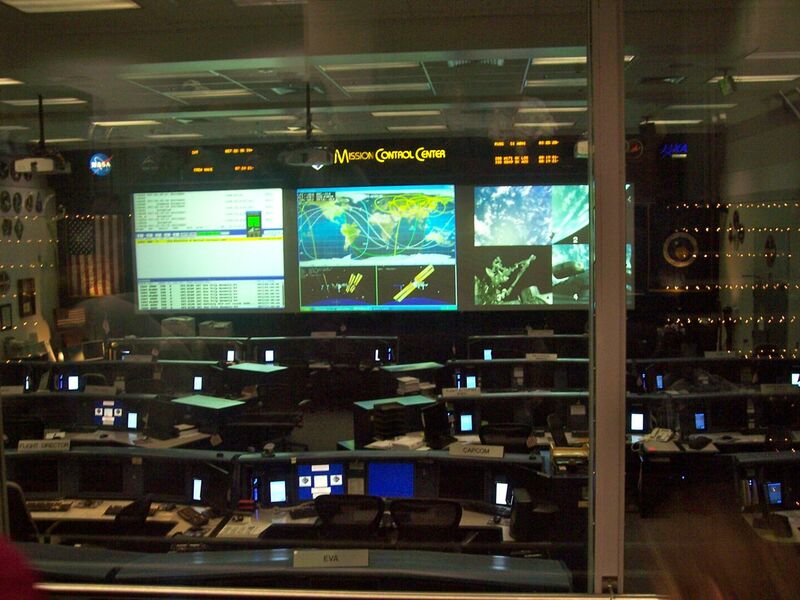 In one building, you get to see Mission Control, where all the action is for space missions. Our guide explained what each section in the room is for - a different area that controls for each specific system for the mission. 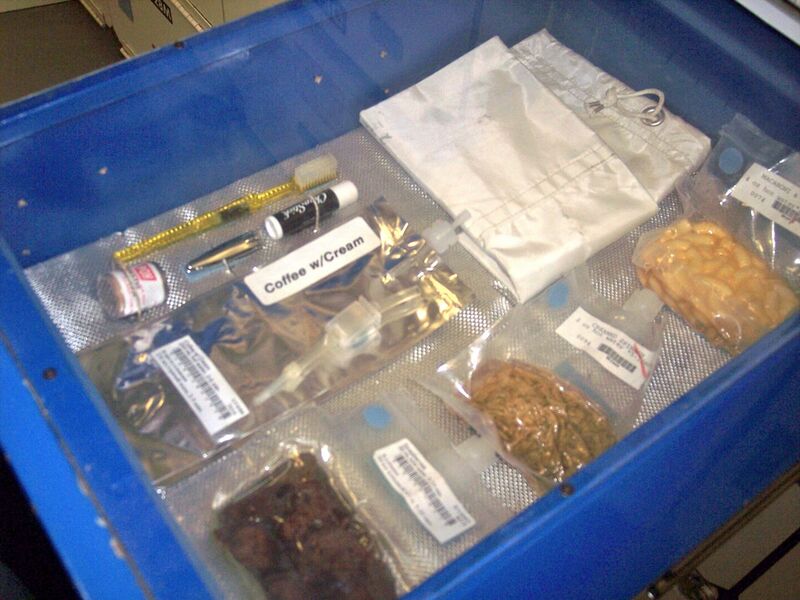 For example, there is one whole section just for the computer system aboard the craft. Another building housed all of the training facilities for astronauts. 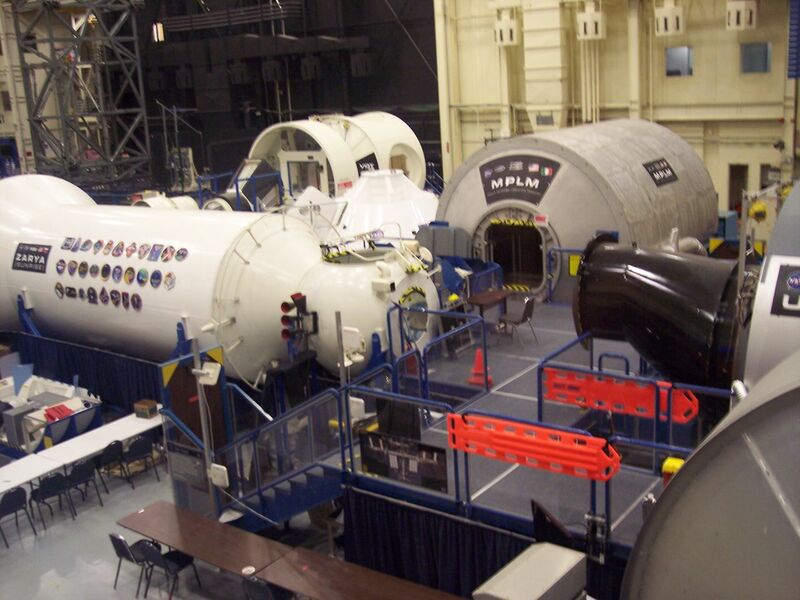 There is a full-sized replica of the International Space Station, so that astronauts can train for what it is like to be there. There is also equipment that helps them simulate weightlessness and how to work in that kind of environment. We got to see the training model of the next form of space travel, the Orion. It goes back to the capsule form of travel, slightly similar to the Apollo missions. The final building we visited housed a Saturn rocket and displays of the Apollo missions that were launched by these rockets. After the tram tour, Chrissy and Rachael wanted to play in the kids' area, so while Jim stayed with them, I took Michael around to a few of the other exhibits. 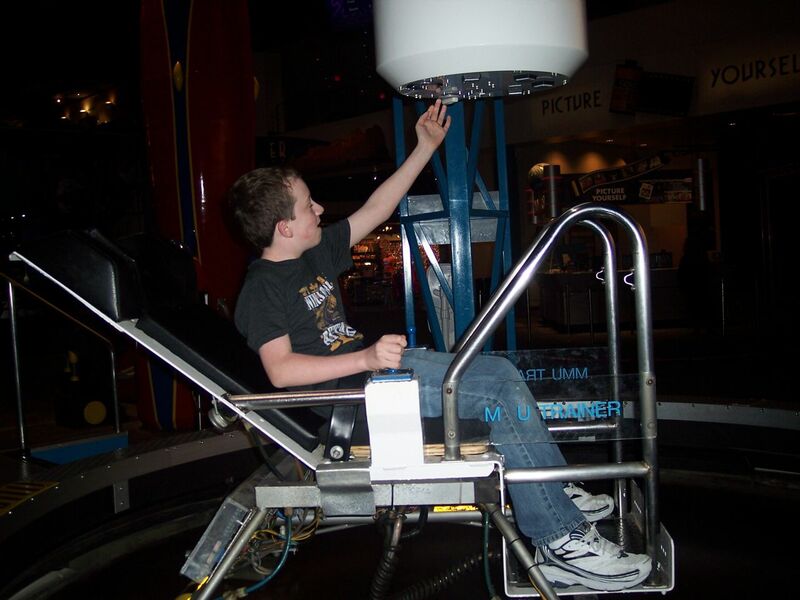 He tried a game that simulated the weightlessness of space and how it feels to control a vehicle against that while trying to complete a mission at the same time. We also went in the crew compartment of a space shuttle. The crew compartment had been cut apart so that visitors could move about freely, but there were lines that indicated where it would normally be. It is a very small space. You could also look through the storage compartments to see what might typically be stored there. Who knew astronauts needed chapstick? It was almost closing time, and we still hadn't done most of the things there, so we decided to come back tomorrow. We are looking forward to it! 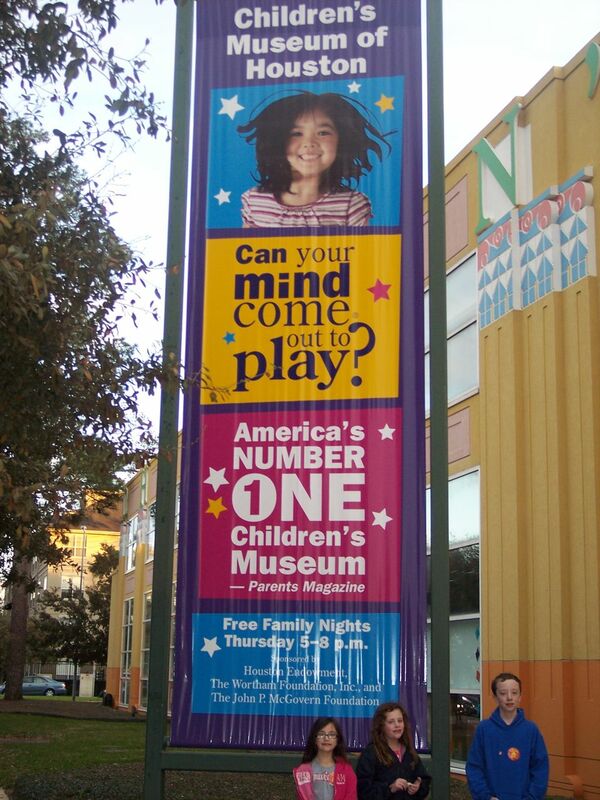 Today we went to the Children's Museum of Houston, which is rated the #1 children's museum by Parents Magazine. While this is a children's museum, it is a member of the Association of Science & Techonolgy Centers, which honors our Fernbank membership. Usually we don't get children's museum benefits, so we were really excited. 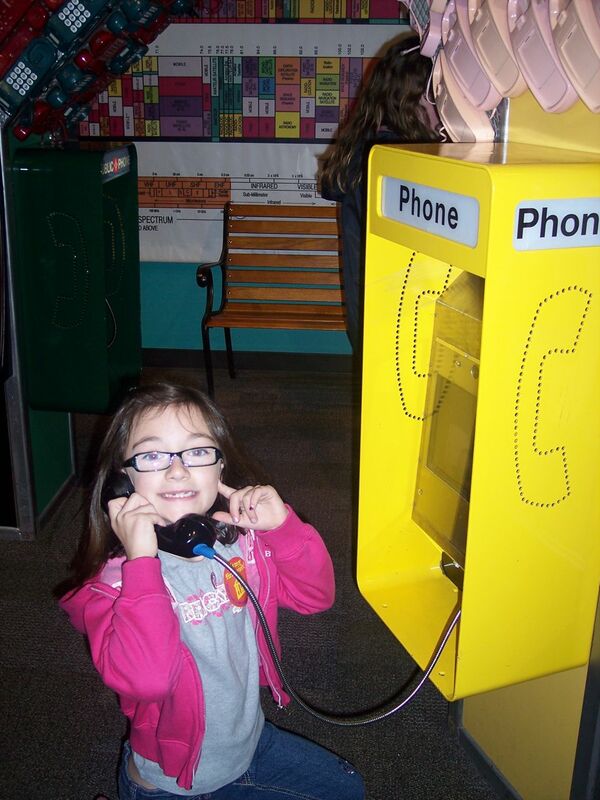 This museum is probably the best children's museum we have been to. 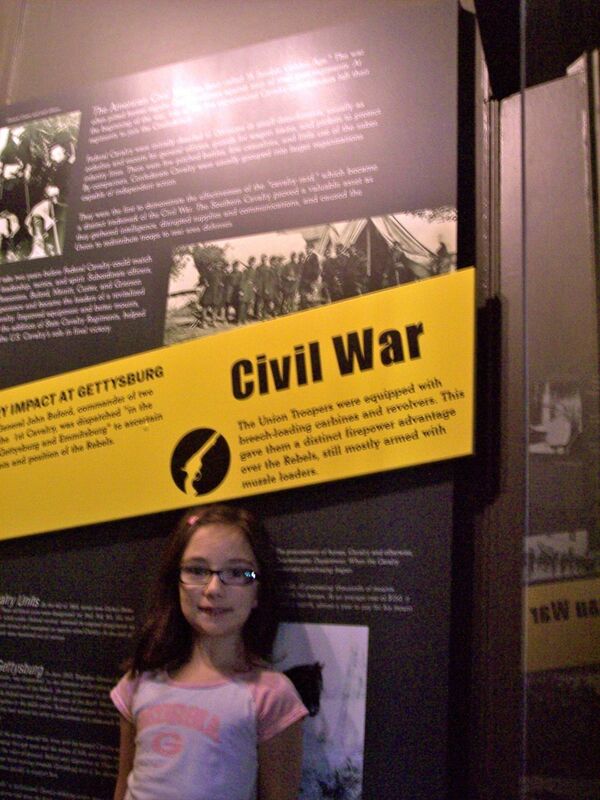 There was such a huge variety of exhibits, geared towards different age levels. We first looked at this 'telephone man'. He was made of all different kinds of telephones, and had pay phones and video phones that you could talk to one another. Chrissy said, "Why is this phone in a box? Do you have to put money in it?" Sigh. It's one of those things that children in this generation have no knowledge of. 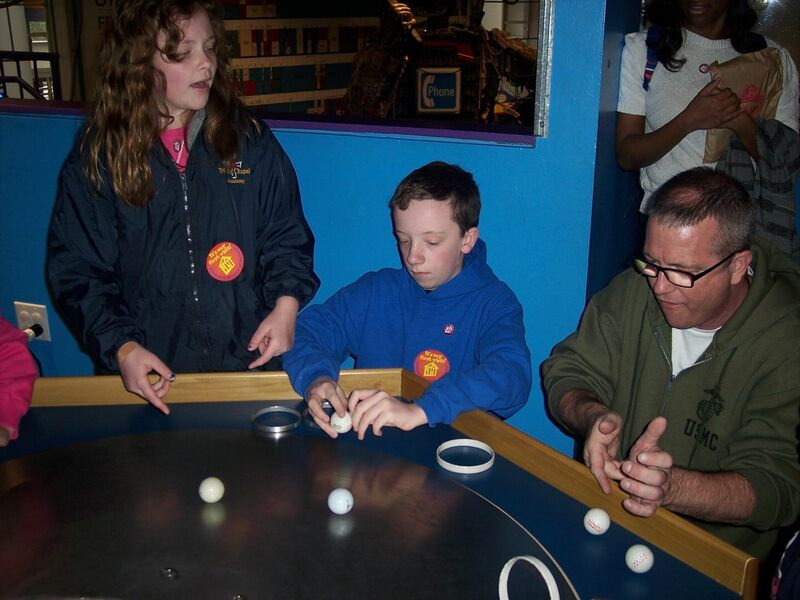 We then went to a spinning disk and tried to spin balls and disks across it, showing how centrifugal force (or, technically, lack of centripetal force) works. Then we built buildings in two different areas. It was a lot of fun. The next area we went to was the Power Play area. Here children can track changes in their bodies in a variety of physical challenges. The challenges included an electronic jump rope, dancing, a three-story climbing tower, snow-boarding, obstacle courses, and rock climbing. The kids could track their heart rates while resting, and then measure them again after completing an activity. We spent most of our time here - they really enjoyed it. Another area was outside - and would be super fun in the summer. Today was cloudy, though, and a little chilly, so we kept it kind of short. It was a large water station where you could shoot water guns to fill up a huge tub until it tipped over. You could also float boats down 'streams' and see the effects of damming the water up. 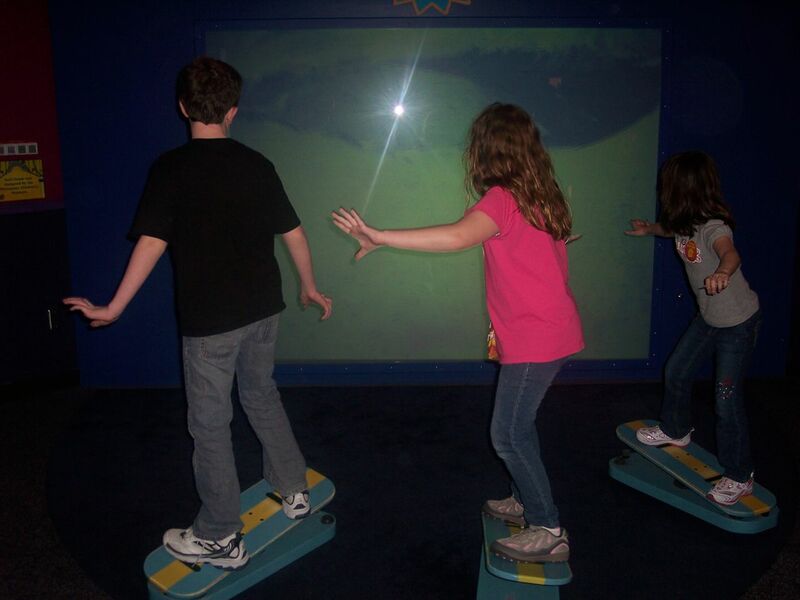 Another part had a 'wave' machine so that you could see the effects of water on the shore. Yet another part of the museum was an entire kid town. 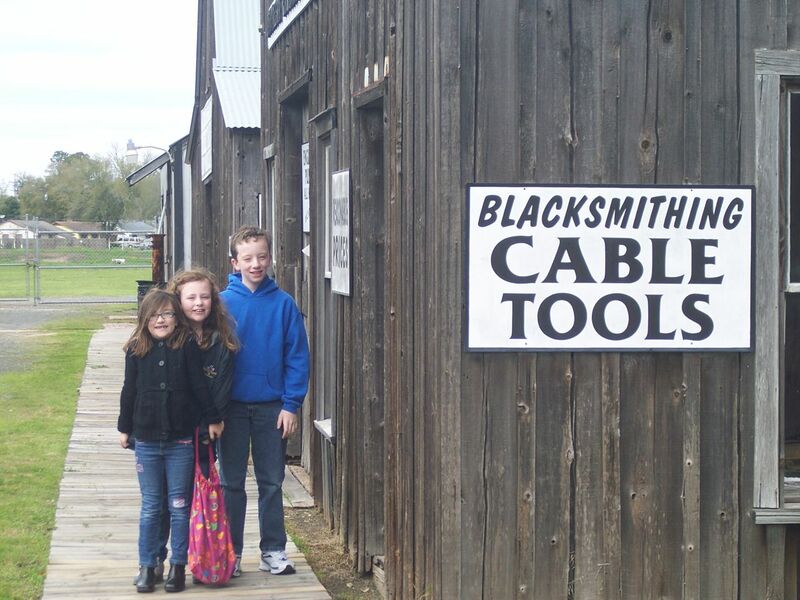 Kids get $40 on an electronic card every time they come to the museum, and they can spend it in this town at any location. There is a grocery store, vet, art museum, a bank, city hall and more. If you want more money, you can go to the bank and they will tell you where you can get a job in town to earn more money. Parents are allowed an 'allowance', although I have no idea what it is good for since we didn't get any. But we had fun 'shopping' in the grocery store, taking pictures, and visiting the vet. There was so much to do in this museum, you could easily spend two days here. 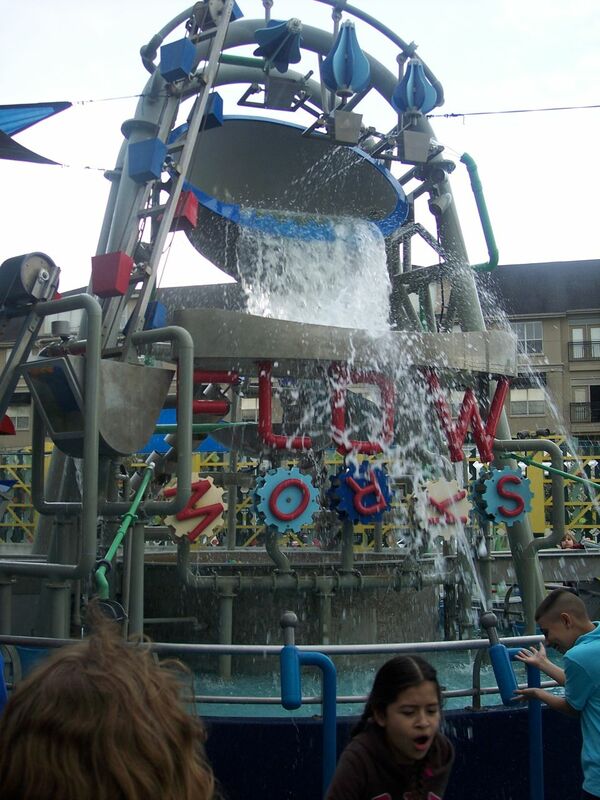 In Houston, it's a must-do if you have kids. Tomorrow we are going to Space Center Houston, where all the NASA action is! Today we had a chance to go around Beaumont a little more. 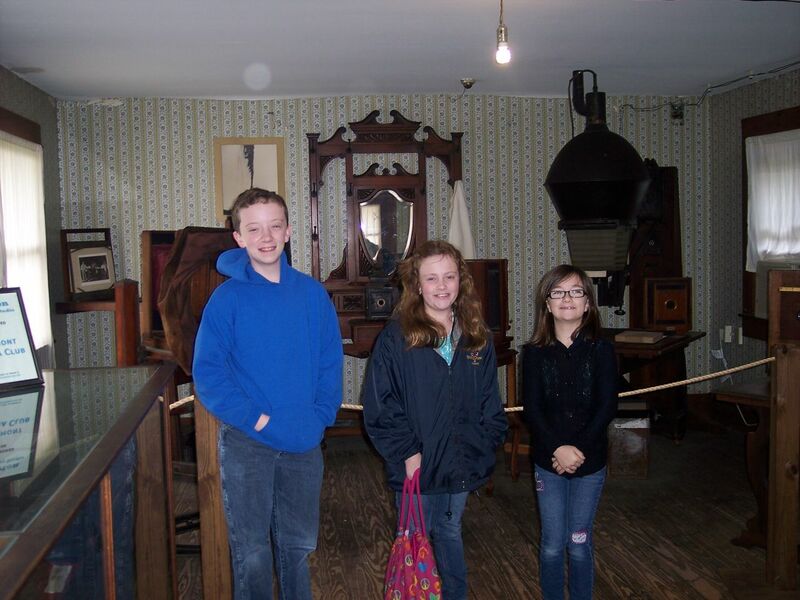 We started off at the Spindletop/Gladys City Boomtown Museum, run by Lamar University. This is a recreated little boomtown, as it would have appeared in 1901 when the Lucas Gusher happened. The Lucas Gusher was the first successful drilling in the area after many failed attempts. In fact, it was so successful that the drillers were completely unprepared for the gusher that erupted. It took 9 days to get the oil flow under control. Two engineers developed a way to cap the flow and get it under control on the spot. Several of the techniques developed and used at Spindletop are still industry standards today around the world. The boomtown replica, Gladys City, wasn't terribly unlike other replica cities we have seen from frontier days. The most notable difference, however, were the printing offices, attorney offices, and the oil company offices. You didn't see those in Boonesborough, Kentucky! All those offices were necessary in an oil boomtown, though. It was especially necessary in Gladys City, where the population grew from 9,000 to 50,000 people in two weeks! Land had to be divided up, and everyone wanted a piece of the oil action. Some plots of land were 1/64th of an acre - basically large enough to put up an oil derrick. 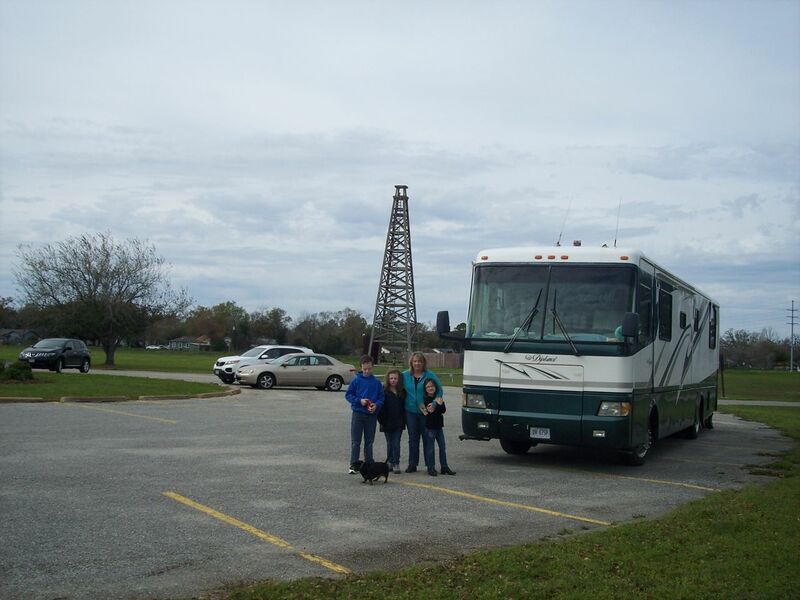 Spindletop changed the oil industry, and it was neat to see that part of American history. We loved this little museum, and I think it was one of Jim's favorite things so far. 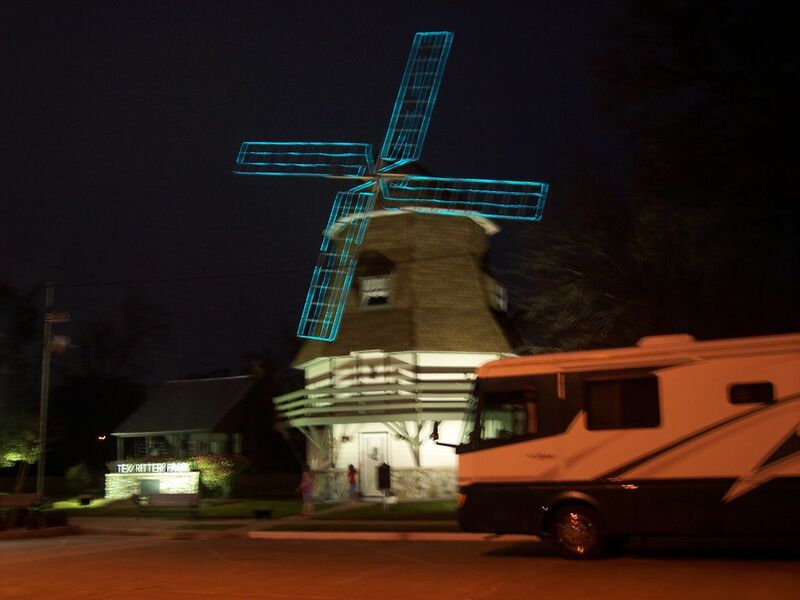 After we finished up there, we drove a little ways south back to Nederland, where the Dutch windmill is. 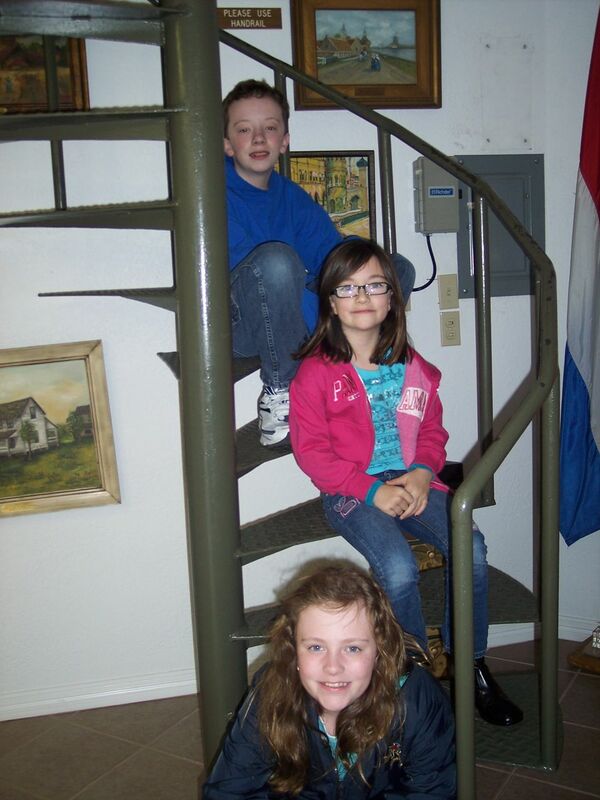 This little museum highlights the Dutch settlers of the area and how it has grown through the years. The museum also had a section dedicated to Tex Ritter, who is from the Nederland area. Next door is a little French settlers home, illustrating the lifestyle of the French settlers that followed the Dutch into the area. We enjoyed talking to the man who was running the French home, who just happened to be Dutch. 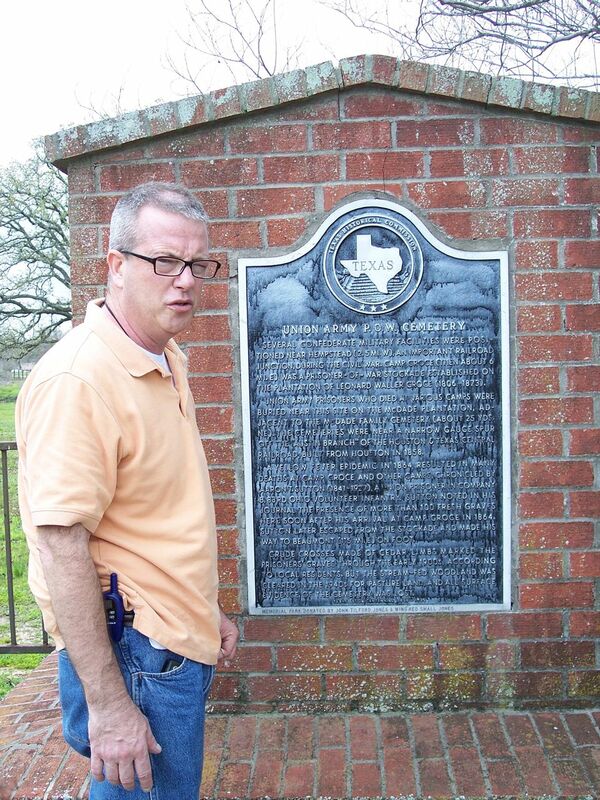 He was quite knowledgeable about the time period and history of the area. It was a great day! We are looking forward to heading into Houston tomorrow. Today we were finishing our drive to Texas! We are so excited! 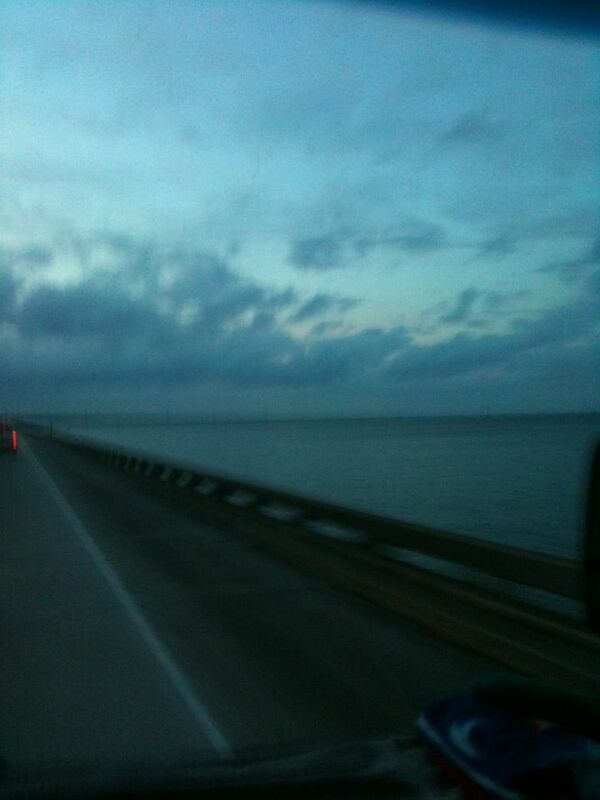 We will also be glad to get out of Louisiana - not that we didn't enjoy it! The humidity is pretty bad, plus the roads are even worse. We are tired of bouncing all over the place! Roadside America is a website that lists all the unusual attractions in the country. It's where we found out about the curved house in Indianapolis. And I looked on their website to see if there was anything along our route worth stopping for. I found it: Rayne, Louisiana - frog capitol of the world. A trio of French brothers began a booming export business in Rayne - frogs. Thus, Rayne became the frog capitol of the world. Roadside America listed a giant frog statue in Rayne, and since it was just off the interstate (and we hadn't passed it already), we stopped. Who doesn't want a picture with a giant frog - with a top hat, no less! It was easy to find, about a half mile from the interstate, across from Frog Bar and Frog Foods. We parked and hiked over to the statue. On the way, though, all over the field, we saw these little mounds. 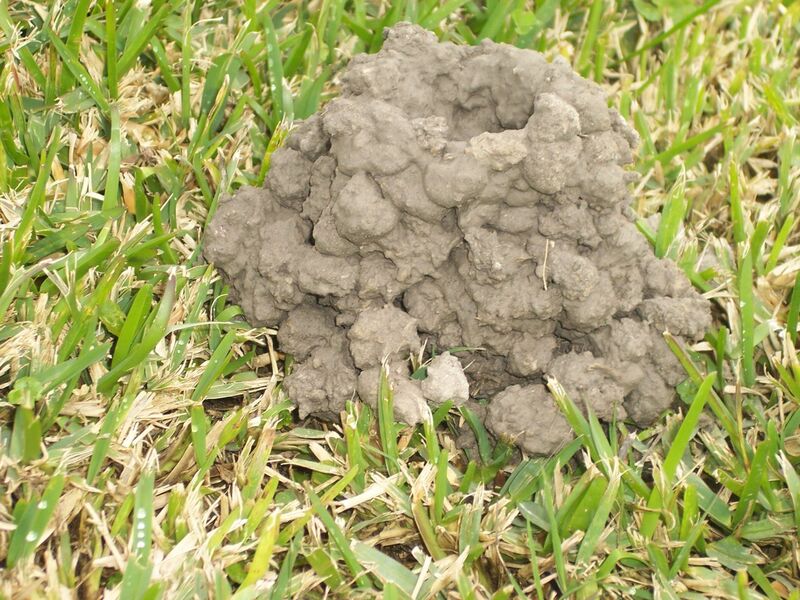 We thought they might just be swamp-land ant hills. We later learned they are crawfish holes. Since the ground stays so wet, the crawfish don't have to dig far to hit water. The frog was pretty cool. The kids had a good time taking pictures with it. As we started back to the RV, there was a candy and ice cream store right next door. We decided to have a look. The Candyland Cottage and Ice Cream Shop was so neat! The owner Stuart was super nice and took all kinds of time with us, showing us around, explaining things, and taking pictures. 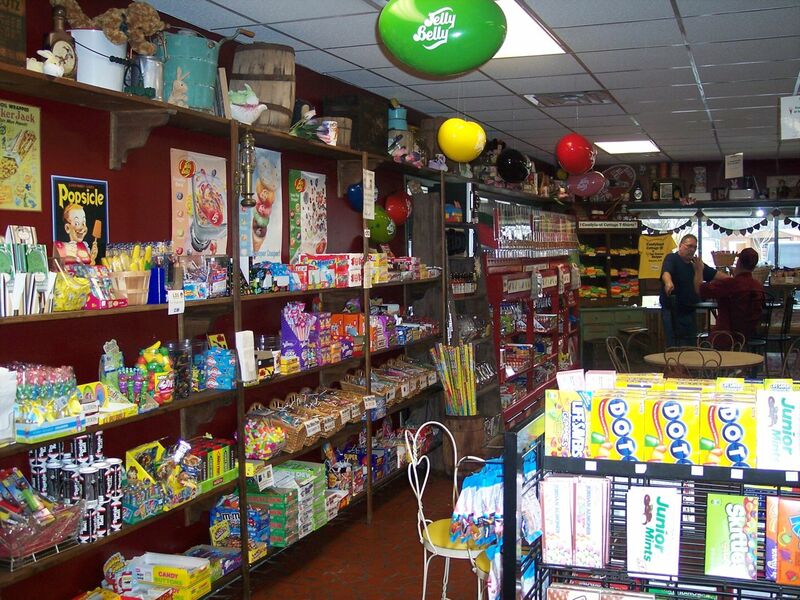 It had all kinds of nostalgic items: an old soda fountain, antique toys, and signs. But it had a huge selection of candy and fudge, too, plus hand dipped Blue Bell ice cream. Yum!! We all had some ice cream (of course! ), and looked around the store. They had a huge jelly bean section with my favorite kind - Pomegranite! Those are really hard to find, especially without being mixed with other kinds, so I got a big bag. The kids all picked out something, too. 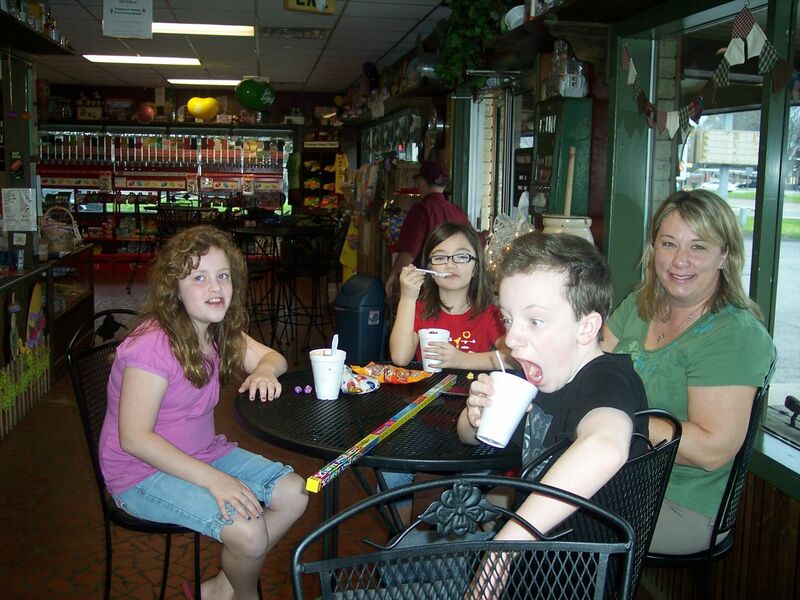 Michael wanted gummy worms and bears, Chrissy and Rachael both got some malted milk balls. Stuart, Jim, and the 26 lb. gummy bear! Another really cool thing they had here were their giant gummy bears. 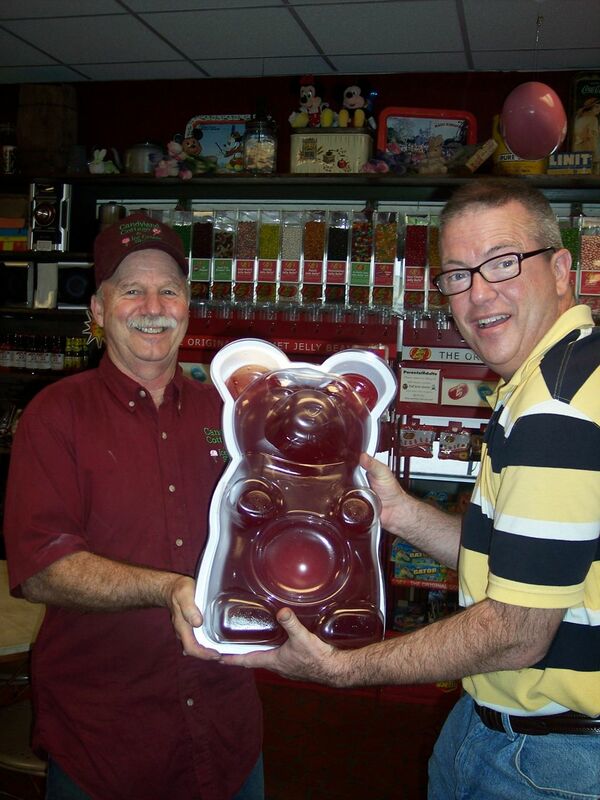 Yes, that's right, GIANT gummy bears! One weighed in at five pounds, but the most impressive one was a whopping 26 pounds! Who could eat that? The owner, Stuart, said one man purchased one as his groom's cake for his wedding! Different idea, but neat. They also had giant gummy worms, which Michael tried unsuccessfully to get us to buy. After we had done some damage there, we headed to another Roadside America attraction: The Wrong Way Catholic Cemetery. 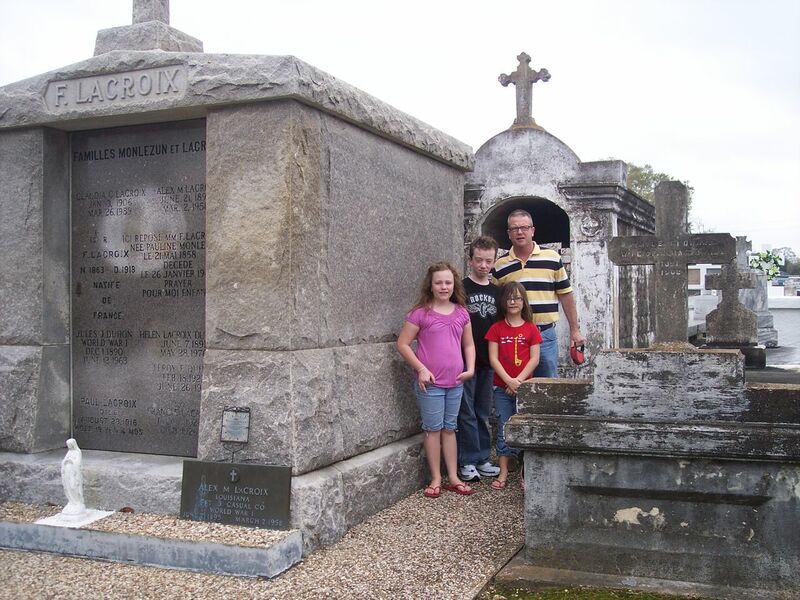 This is featured in Ripley's Believe It or Not as the only cemetery in the US where the graves run north-south, instead of the traditional east-west. The story goes that the town used to be located five miles south of where it sits today. When the railroad came through, it bypassed the town. Knowing how important the railroad was, the residents picked up and moved everything to near the railroad. Yes, they loaded up the buildings and moved them - even the cemetery. Once everything was being laid out, and the graves had already been reestablished, they realized that the graves were facing the wrong way. Instead of causing additional trauma to the families, plus the added expense of redoing everything, they left it as it was. So this is another of Rayne's claims to fame. 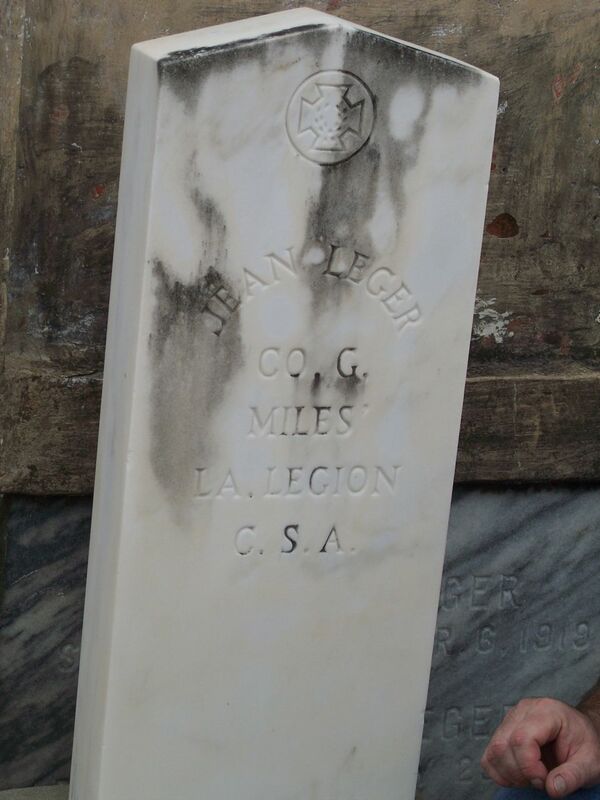 We saw headstones for Confederate States of America Soldiers, with no adjoining crypts. 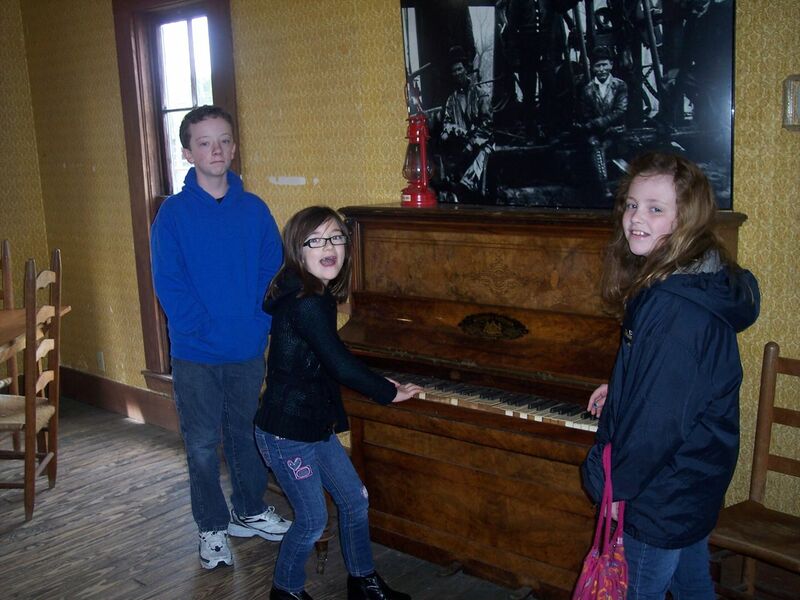 We called our family historian, Uncle Jack Ellis, who had two possible explanations. First, the marker would represent a Soldier that didn't come home. Second, some states established cemeteries to honor their fallen Soldiers. The crypts were moved there and a marker was placed in the local cemetery. Thanks Uncle Jack - you're the best! 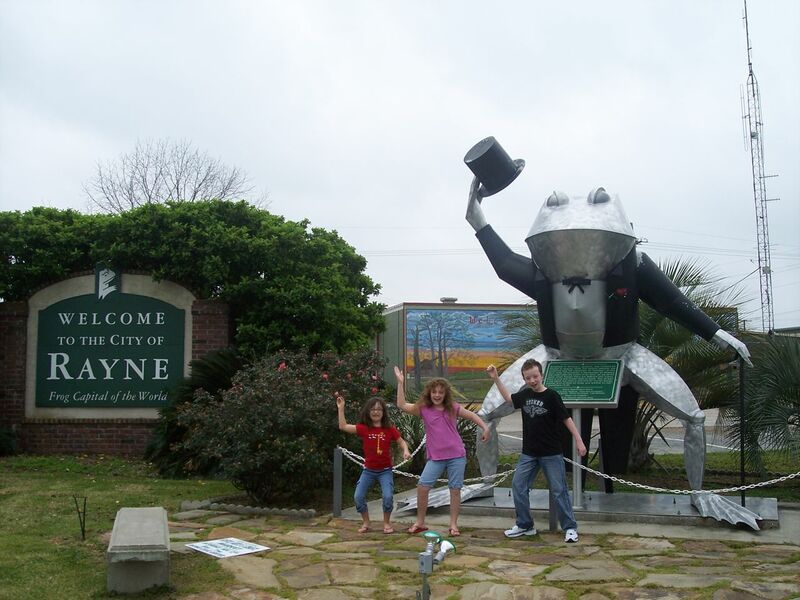 After spending a lot more time in Rayne than we anticipated, we got back on the interstate. One of the best parts of traveling like this is that when we see something neat like that, that we want to explore further, we can. We aren't on a fixed schedule and it allows us a little more flexibility. God has blessed us in being able to do this! Big star for a big state! 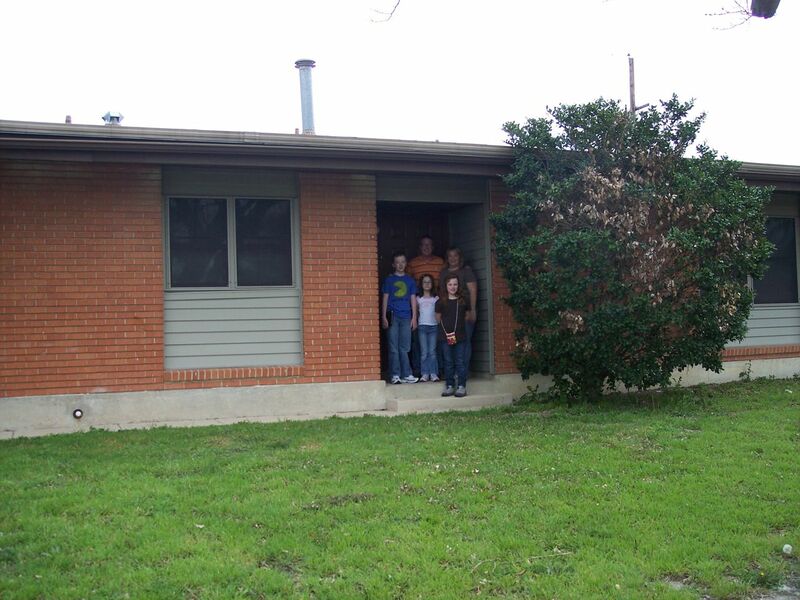 We weren't far from the Texas state line, and once we crossed over, we stopped at their welcome center. They had tons of information divided by region, and we found a lot of things we were interested in visiting throughout the state. There was a long boardwalk, too, that went over the surrounding swamp. You could walk and learn about all sorts of wildlife and history of the area. 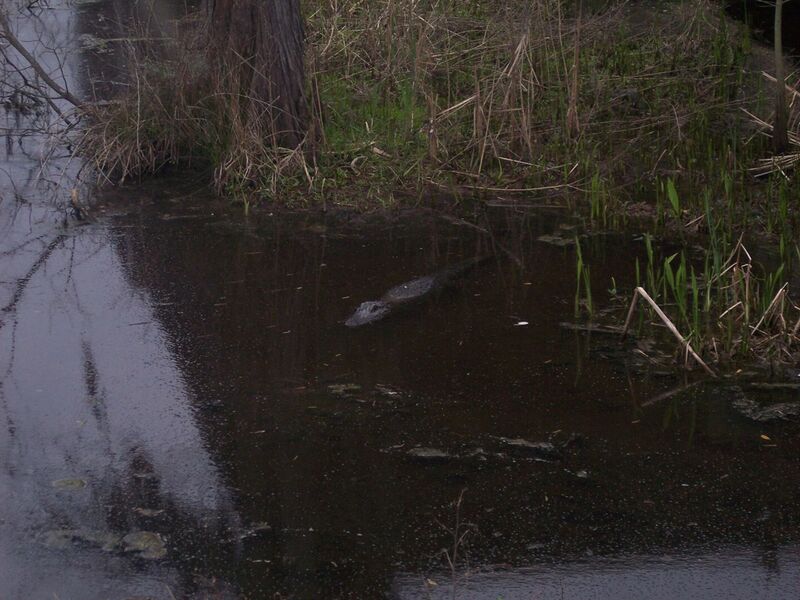 There was also a resident alligator! We took lots of pictures there and let the kids run off some energy. 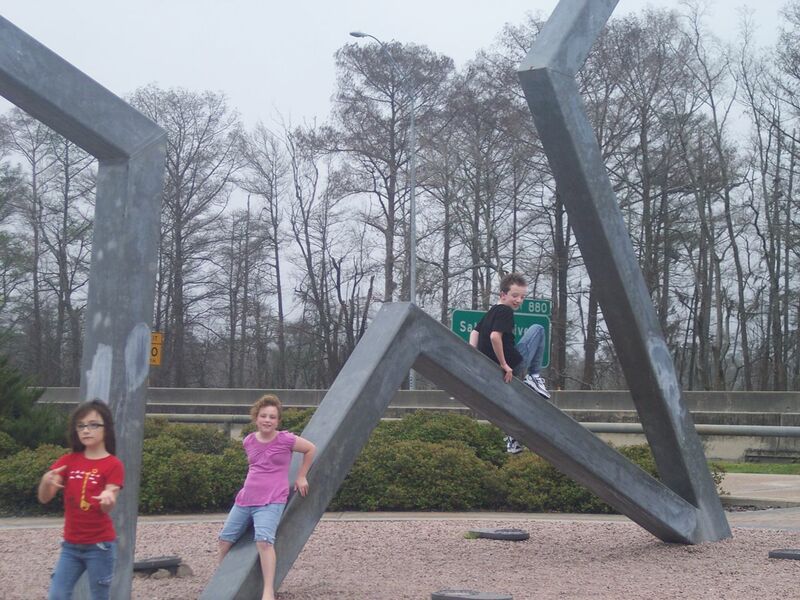 Next we went into Beaumont, Texas. This town is the site of the first big oil boom. There is a museum for that that we plan on visiting tomorrow. 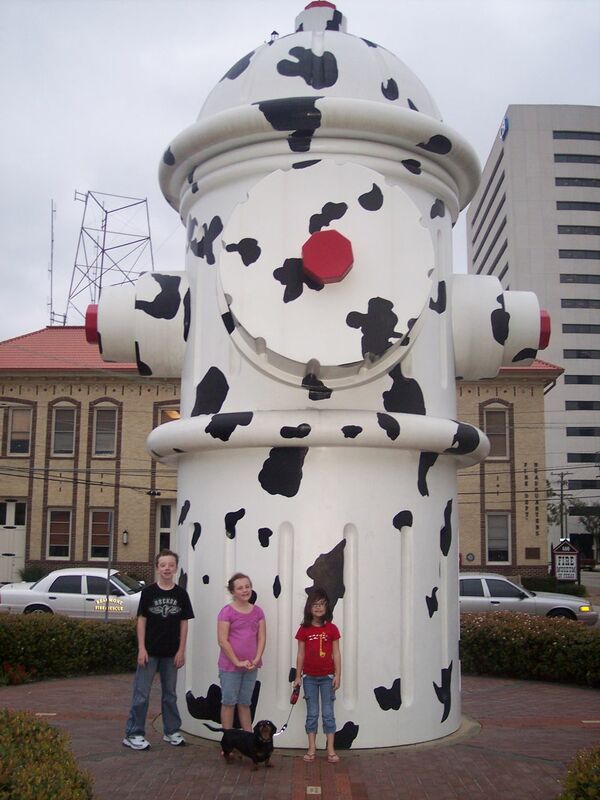 But for now we headed into downtown Beaumont to visit another Roadside America attraction - the world's third larget fire hydrant. This is about 24 feet tall, and painted like a dalmation. It sits across the street from the Texas Fire Museum. We had to take a few pictures of Sam next to the fire hydrants. There are also a memorials to Texas firefighters and to the World Trade Center firefighters. After pulling out of there, we drove down to Nederland, which is a town just south of Beaumont. Here there is a life-sized windmill as a tribute to the Dutch settlers of the area. 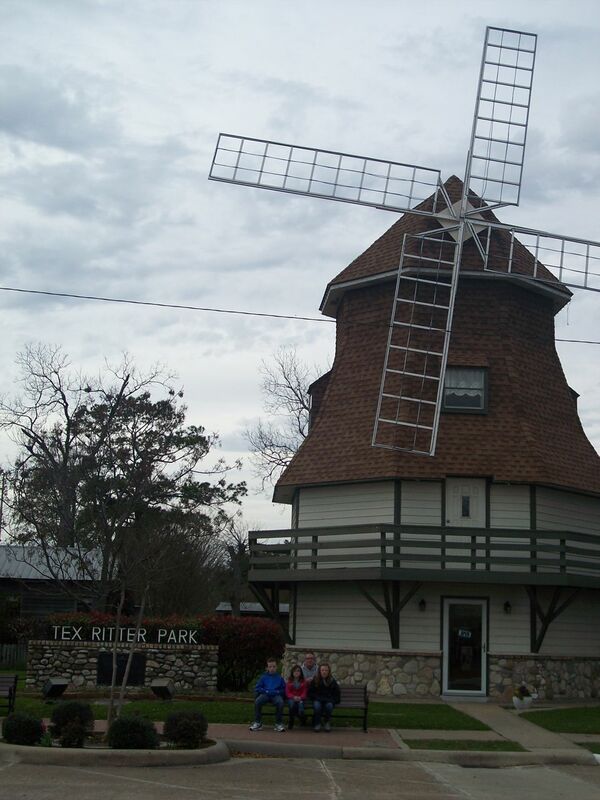 Tex Ritter was also from Nederland, and the park with the windmill is named for him. The museum was closed, so we will try to come back tomorrow. It made for a full day of giant things. Would you expect anything less from Texas? Today we packed up and got ready to head out of New Orleans. Jim had some minor regular maintenance to do, plus return our rental car, so he work on that. We cleaned inside and finished up some homework assignments. By the time we were ready to pull out, it was about lunch time. 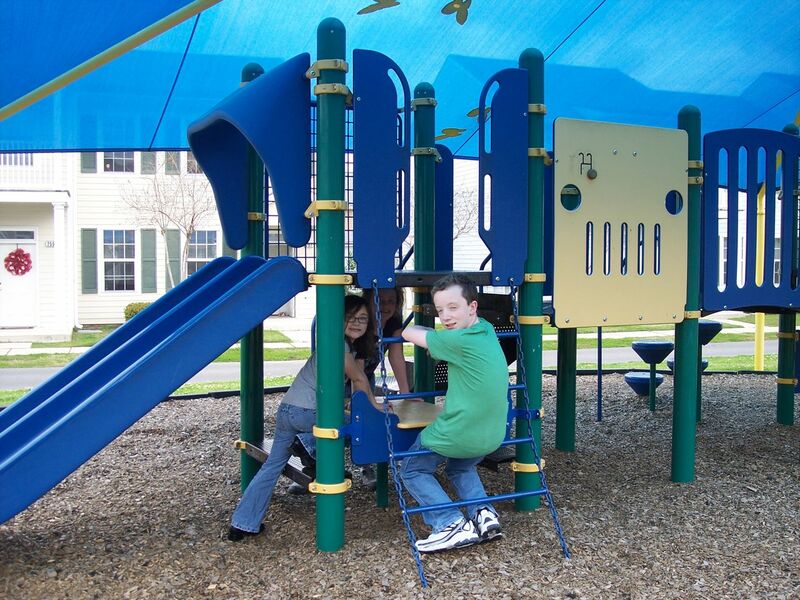 We had also been promising Chrissy that we would find a playground on base and play there for a little while. So when we left the campground, we drove over to where the base housing was, knowing there would probably be a playground there. 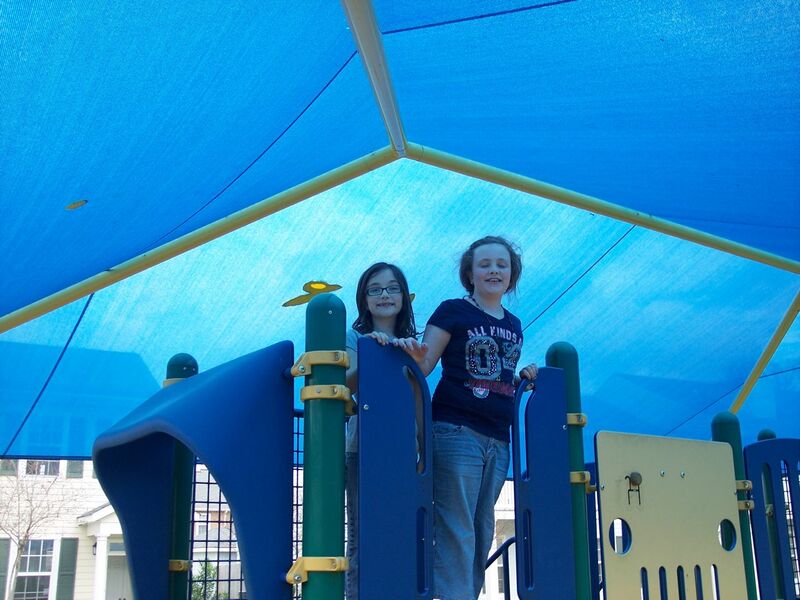 We did find a nice little playground, and as it got a little later, the kids who lived there were all outside playing. 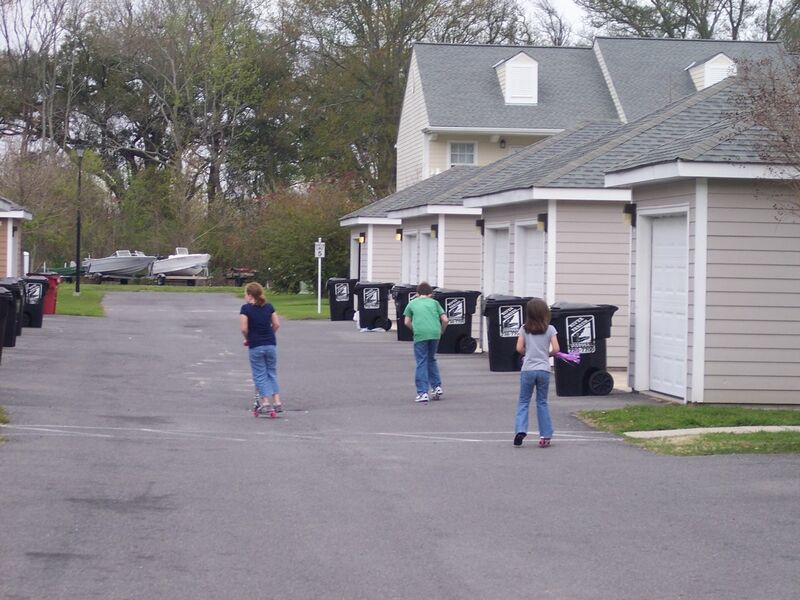 There were games of Nerf Gun attacks, hide and seek, and other fun games. It was really neat to see kids outside playing and having fun without having to worry about strangers. On a closed base, that's not really a problem. We even got a little air show while they played. 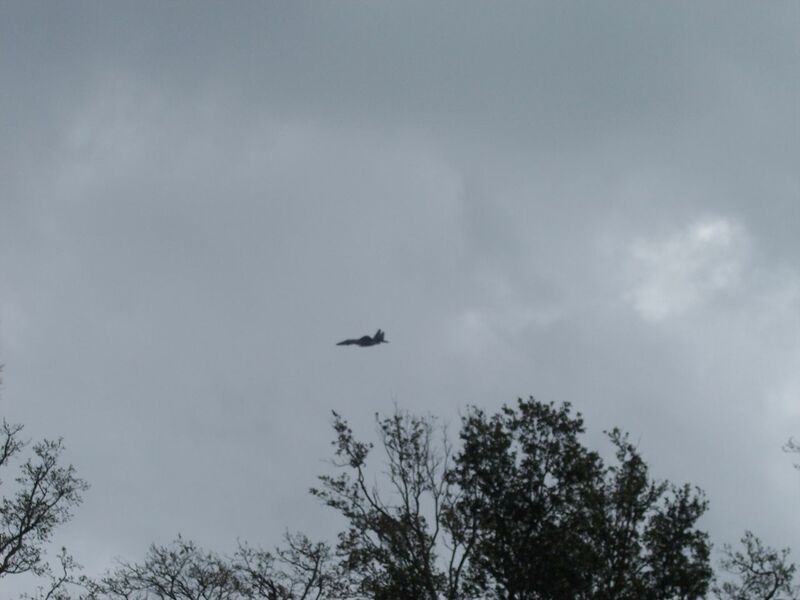 One of the Navy jets was doing air maneuvers. Very impressive! The kids played for a while and we headed out. We were hoping to make it to Texas, but with traffic, it wasn't looking likely. So this was a short day - blog wise, anyway. Tomorrow we make it to Texas! 4th Trip Route! Tell Us What To See!